Dornella Connors was shot in the eye after her boyfriend tried to run over police in Ferguson. Dornella is the mother of two small children. Her boyfriend was arrested. The boyfriend of the pregnant, blinded Ferguson protestor tried running over Ferguson police with his car, Gotnews.com has learned. Law enforcement sources in the Ferguson police department describe the boyfriend, wanted on previous charges, as trying to hit Ferguson police officers with his car. Deangelas Lee, 21, of Black Jack, was charged with second-degree assault on a law-enforcement officer. Police said a uniformed officer got out of a police car and approached Lee’s car. Lee began driving the car at a high rate of speed toward the officer, police said. The officer fired a “less-lethal” projectile from his shotgun, hitting the vehicle. The vehicle was later stopped at a check point in Jennings and Lee was arrested. A passenger in the car suffered an eye injury, though it was not clear how. Her condition was not known. 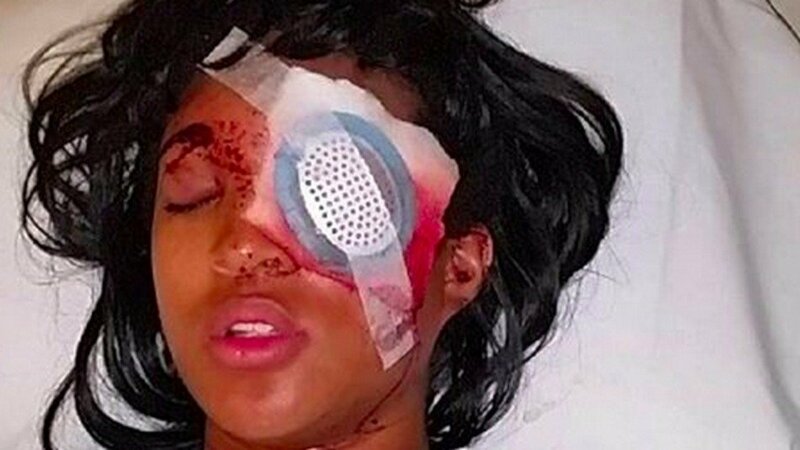 Dornella Connors lost an eye after police shot a bean bag at the car she was riding in. Dornella lied to the media about the encounter.